Happenings with Z5: Half Marathon! On Sunday, I finished my 4th half marathon! So hard, but so much fun!!! I decided that I was going to wear my Coug gear for the race; hence the GO COUGS! My sister Cynthia & her husband Mike also ran the race. 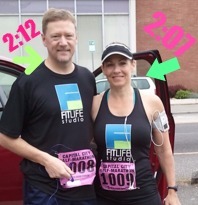 Cynthia had a goal to run the half in 2:07. Guess what! SHE DID IT! Mike finished in 2:12 with an injured hamstring!!! My goal next year: to beat 2:59!!! I am already looking forward to May 2013!! !